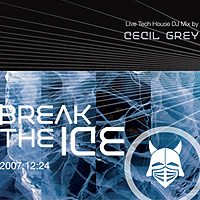 NYC producer and DJ Cecil Grey (Knights of Pan) blends a live mix of international tech house tracks in his latest podcast episode, Break the Ice. Sometimes minimal, sometimes a distant echo of Berlin dub, sometimes abstract… these selections reflect the subtle moments of warmth lying hidden in the coldest days of Winter. This entry was posted on Monday, December 24th, 2007 at 12:00 pm and is filed under Podcast. You can follow any responses to this entry through the RSS 2.0 feed. You can leave a response, or trackback from your own site.